The Music Garden is an exploration of music as interpreted through gardening on a grand scale. The film follows the efforts of Yo-Yo Ma and landscape designer Julie Moir Messervy to create a formal garden, based on J. S. Bach's Suite No. 1 for Unaccompanied Cello, in the center of Boston. Woven throughout this unusual enterprise is a performance of the suite by Yo-Yo Ma, accompanied by special effects that bring the dream of the garden to life. 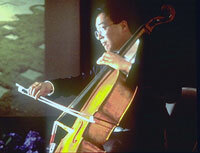 "Excellent footage and astute editing link the various old dance forms of Bach's music to sheltering forests, winding paths, and other aspects of the landscape...Yo-Yo Ma's creative concept, Messervy's enthusiastic vision, and the tough realities pulling at the actualization of an unusual project are deftly visualized in this striking production." "Ma...play(s) Bach in some stunningly photographed garden sequences." "Bach (is) presented as many have long viewed him - as godly as nature itself"